The PlayBook, as it is known Blackberry’s tablet, is the first device to run Blackberry Tablet OS, based on QNX Neutrino, and runs apps developed using Adobe AIR. It was later announced that the Blackberry Tablet OS would be merged with the existing Blackberry OS to produce a new operating system, Blackberry 10, that would be used universally across BlackBerry’s product line. A second major revision to the Blackberry PlayBook OS was released in February 2012. The Playbook also supports Android OS applications, allowing them to be sold and installed through the Blackberry App World store (1). 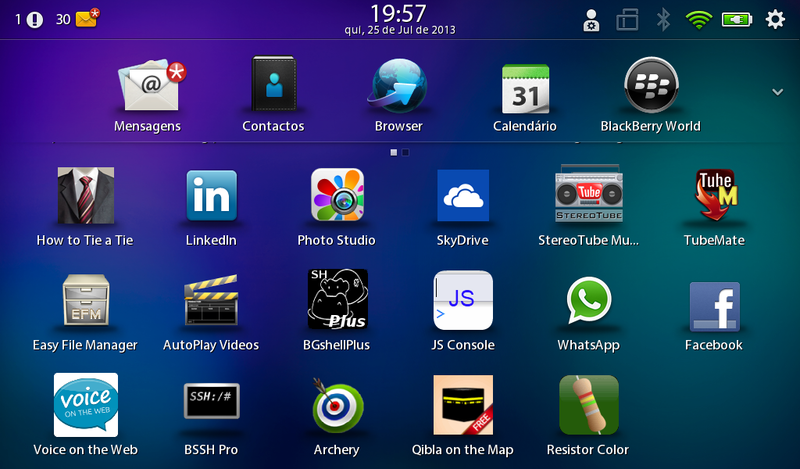 It is quite easy to design apps for Playbook, with recourse to Blackberry’s WebWorks SDK. Blackberry WebWorks for Tablet OS as the name “WebWorks” implies, is a platform for building deeply integrated web applications for the Blackberry PlayBook http://us.blackberry.com/developers/tablet/webworks.jsp. 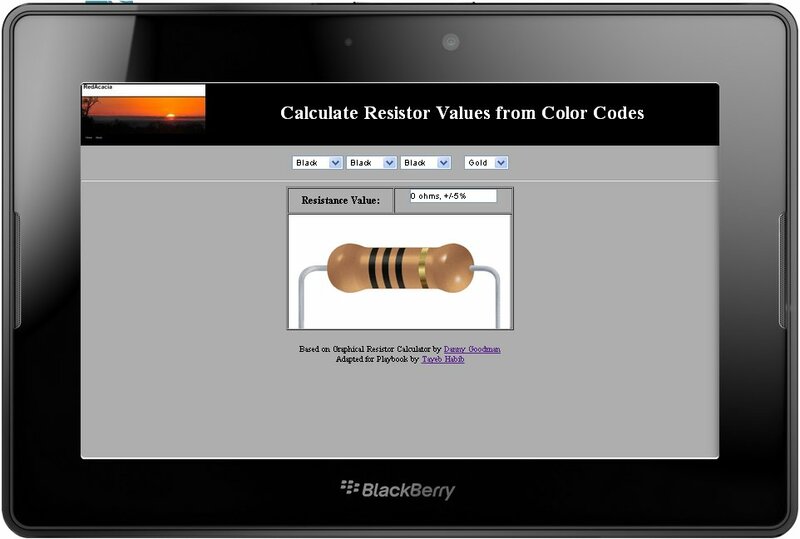 We are going to design a “Resistor Code” App with Blackberry WebWorks SDK. where I is the current through the conductor in units of amperes, V is the potential difference measured across the conductor in units of volts, and Ris the resistance of the conductor in units of ohms. The ratio of the voltage applied across a resistor’s terminals to the intensity of current in the circuit is called its resistance, and this can be assumed to be a constant (independent of the voltage) for ordinary resistors working within their ratings. Resistors are common elements of electrical networks and electronic circuits and are ubiquitous in electronic equipment. Practical resistors can be made of various compounds and films, as well as resistance wire (wire made of a high-resistivity alloy, such as nickel-chrome). Resistors are also implemented within integrated circuits, particularly analog devices, and can also be integrated into hybrid and printed circuits. 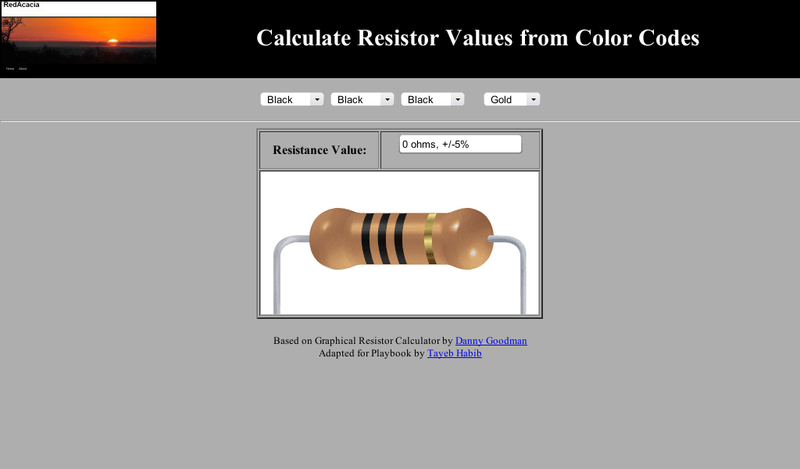 What’s Color Code of a Resistor? The electronic color code was developed in the early 1920s by the Radio Manufacturers Association (now part of Electronic Industries Alliance(EIA)), and was published as EIA-RS-279. The current international standard is IEC 60062. Colorbands were commonly used (especially on resistors) because they were easily printed on tiny components, decreasing construction costs. However, there were drawbacks, especially for color blind people. Overheating of a component, or dirt accumulation, may make it impossible to distinguish brown from red from orange. Advances in printing technology have made printed numbers practical for small components, which are often found in modern electronics. The creating of Playbook packages is done with not many external requirements. However, you need to use external tools in order to generate signing and debugging assets required to put deployments onto device. Blackberry Web Works SDK must be installed in order to obtain various tools required for obtaining certificates and device provisioning. Follow the instructions at https://bdsc.webapps.blackberry.com/native/ to download the SDK and any additional tools listed on the page. Install the SDK to your development machine. I assume that you have the Development Machine ready by now as you proceed to next steps. If not, I recommend you set up the Development Machine before proceeding. We will start by requesting a code-signing keys at https://www.blackberry.com/SignedKeys/. They are absolutely free! Enter your name, company, email, country and a 6-10 digit “PIN.” Take note of the PIN since you will need it in next steps. I suggest you write down in a file named says “keys.txt” in a folder say named “BB”. RIM will tell you to allow up to two hours in order to receive your code-signing keys by email. When you are registered you will receive code-signing keys. You will receive a “PBDT” *.csj file, and an “RDT” *.csj file. A full listing of DOS commands can be found at Wikipedia. If you know how to deal with DOS (check in previous paragraph Wikipedia’s link to learn about DOS commands) you can get there step by step. I advise you at this juncture to review your knowledge of DOS commands. I have blurred my password. Take note of the password you have just made up, and keep it safe. You will require this password in next steps, and in the future. Next run the following DOS commands using PIN and password you have just decided upon. 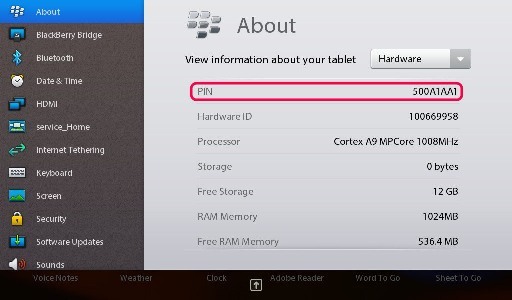 Where the brackets are, you have to write your PIN and your PBDT csj file name, the latter is sent to you by RIM. We are now ready to generate keypair which will allow us to sign our apps. I have blurred author, and other relevant information. I hope it will not be too difficult for you to do it . We will now generate a debug token for testing the App we are going to design. The debug tokens has *.bar file extension, so our output name will be like “debugToken.bar” or any other you choose. N. B. 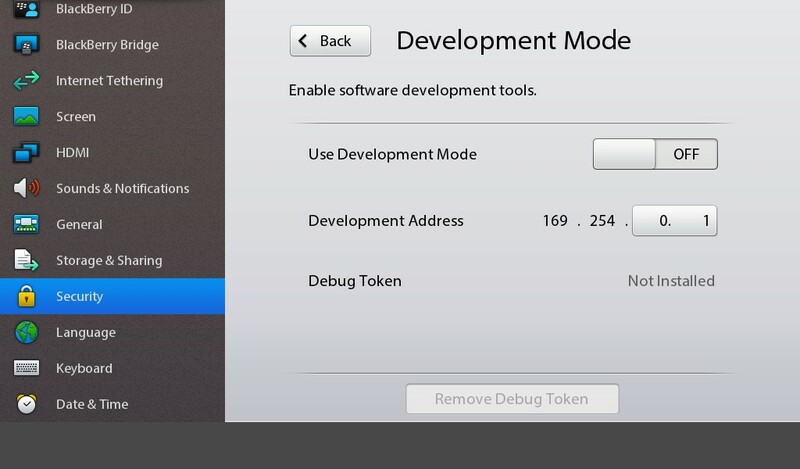 You can create multiple debug tokens for each of your Playbook using “-deviceId” arguments. I am not so rich, so I have only one Playbook. This is not my Playbooks’ PIN! I found this image on the web, and credit is due to the author of this image! First of all connect your Playbook to your PC with USB cable (recommended), but you can also do it with Wifi. You will now enable your Playbook in Development Mode in Security > Development Mode from system preferences, and you will need to have yet again a new password which I suggest to be as simple as 123. For Development Mode on your device, go to Security > Development Mode from system preferences. And set it ON. The following image shows “No debug token” and Development Mode is OFF. In order not to reinvent the wheel, you will accept my zipped file “rescolor.zip” which you can download from Bitbucket, an unlimited free private repositories’ site. Unzip the contents of zipped file. You will need an unzipper program perhaps. And now view the webpage (use Google’s Chrome as you will need it from now on). We are going to use the web app in the file to make our Playbook App. You will notice there is a config.xml file in unzipped contents you have just downloaded. This file is required to compile our App. You can preview how our App will look like on Playbook, by installing Chrome’s “Ripple” plugin. You can read about how to install it in Blackberry’s Developper pages. We will next create a bar extension file of our zipped file (you just downloaded). If you have made any modifications to extracted files you will need to create a zipped file, that is if you want to implement your modded webpage. This error unknown protocol: c is what we need to sort out, as the Warning on feature is not so important at this stage. This solution was found at Blackberry’s Discussion Forum. I did not find any alternative solution yet. If you check your output directory, you will now find rescolor.bar. First of all thank you to Wikipedia for providing valuable information that I have used just about cut and paste at the beginning of this post. Also credits are due to Blackberry for providing so much valuable and free information on the Web. A special thank you is also due to Danny Goodman for his “Graphical Resistance Calculator” web application which has served to design our App. Also all credit is due to Joshua Granick for his easy to follow page on How to Create Keystore for Blackberry. Once more I thank Bitbucket for providing me a free of charge repository from where rescolor.zip can be downloaded. 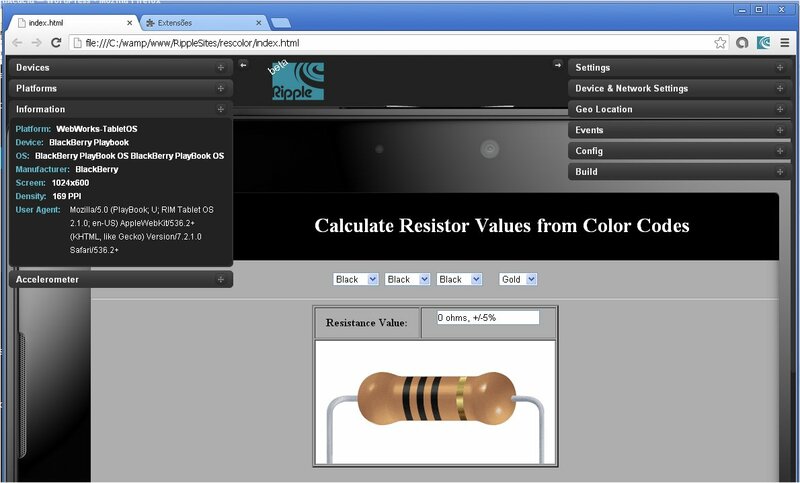 This entry was posted in Mobile Apps, Programming, Uncategorized and tagged App, BlackBerry, Color Code, PlayBook, Resistance, Resistor Code, Web Works SDK, WebWorks. Bookmark the permalink.